Every detail thought through, to maximize efficiency and minimize steps. NaVetor creates simplicity out of the complex. Start here. Create different dashboards with different permissions and views for the different roles in your practice, where important information is consolidated into a single view. See upcoming appointments, checked-in patients, all-staff announcements and notifications. Check patients in when they arrive – right from the dashboard. View important key performance indicators that measure the health of your practice, such as performance by provider, patient compliance, and more. 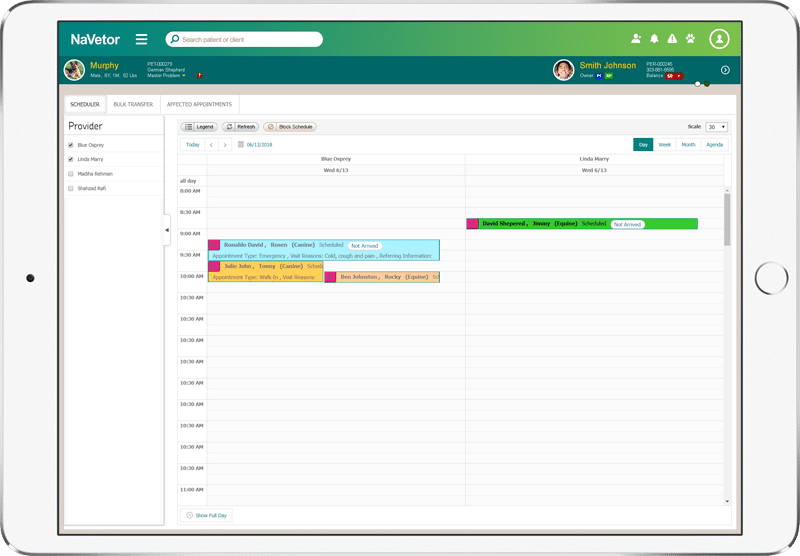 NaVetor’s appointment calendar allows staff members to customize their displays and work quickly to schedule or reschedule appointments. View single or multiple appointments by day, week, month, or by provider. Easy check-in, blocking, scheduling and rescheduling. Check patients in right from the calendar, which also creates a ready-to-use SOAP record at the same time. See who’s ready for check out and invoicing. 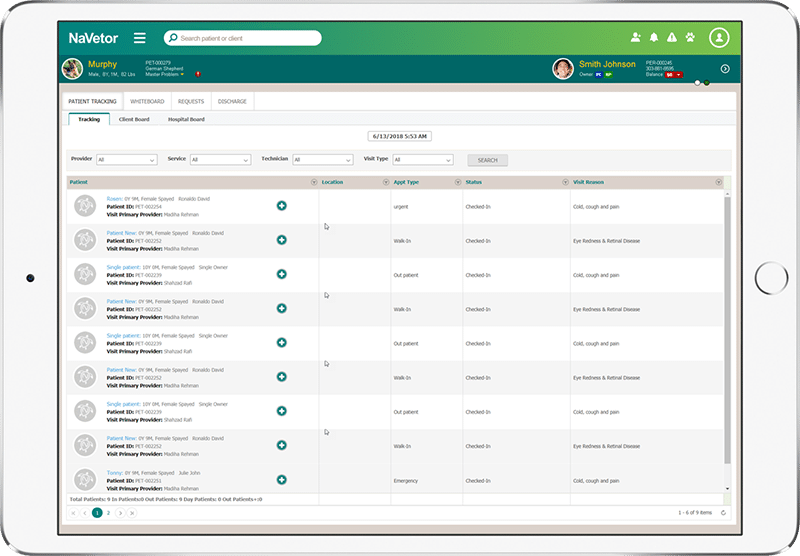 Maintain a quick, snapshot view of everything happening within your veterinary practice. Shows status, location, and appointment details of all checked-in patients. Contains a client-friendly view that can be projected into your waiting room or on your website, where clients can see the status of their pets. Designed to efficiently create and maintain paperless medical records for each patient, so you can make better decisions, manage treatment plans, and capture charges electronically. 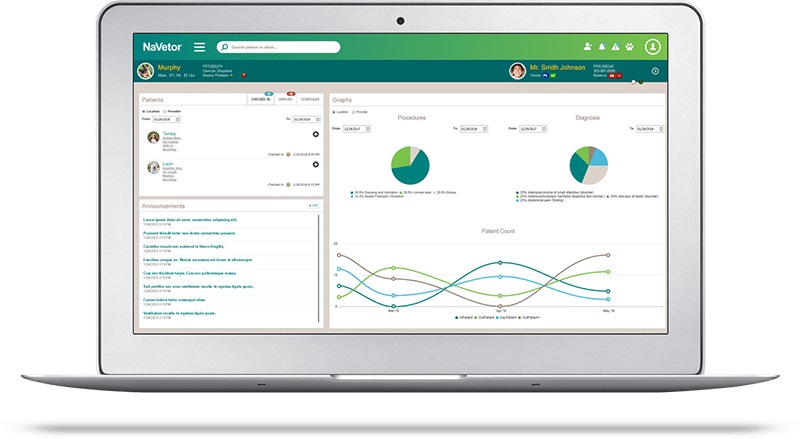 Tracks patient visits, SOAP records, treatments, and client communication via phone/email/text – all in one place. Integrates with inventory, diagnoses, and labs, and stores scanned documents and images. Contains treatment plans to help you identify, administer, and evaluate the best treatments possible. Create templates for treatments you prescribe often to speed up your workflow. Treatment plans are tied to invoicing, inventory, and data analytics for a full picture of your business and financial health. 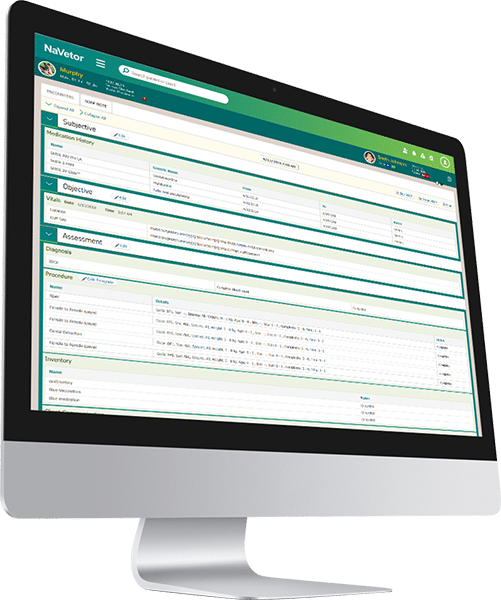 Comprehensive billing and financial management feature helps streamline administrative processes and easily manage the business side of practicing veterinary medicine. Capture charges in the electronic medical record as services are performed within the treatment plan, and automatically include them in the client invoice. 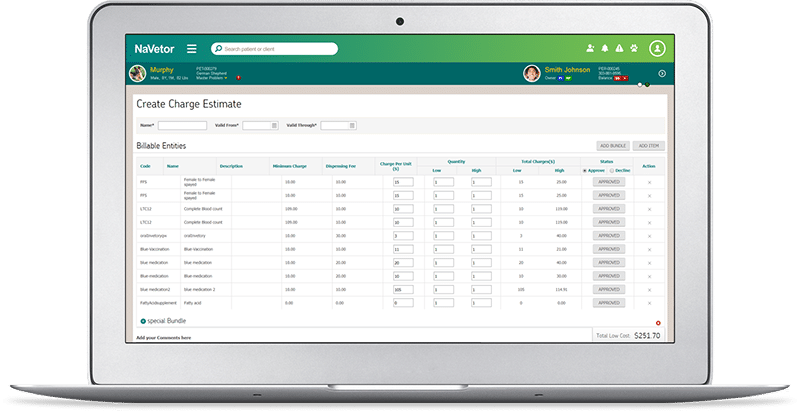 Easily create estimates for recommended procedures, with expiration dates automatically set. Capture pet owner signatures electronically to verify acceptance of procedure costs. Track deposits for certain procedures in advance, without applying them to an existing past-due balance. Manage your inventory electronically to take the guesswork out of ordering and reordering. 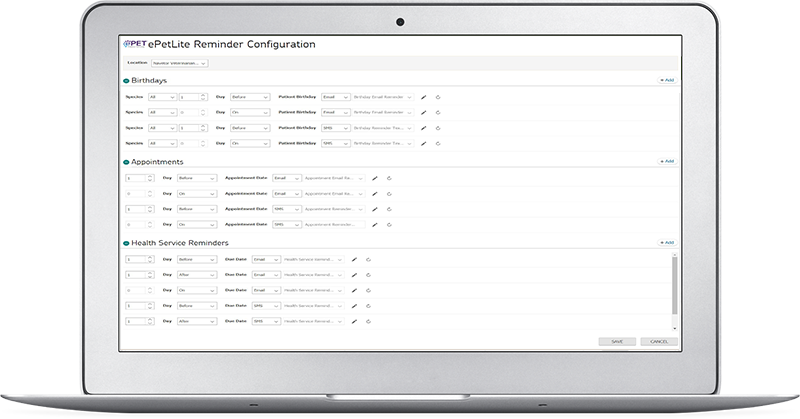 NaVetor’s intuitive, streamlined approach allows you to quickly add or update the products you keep on hand. You can easily add an item to a purchase order or update products received. 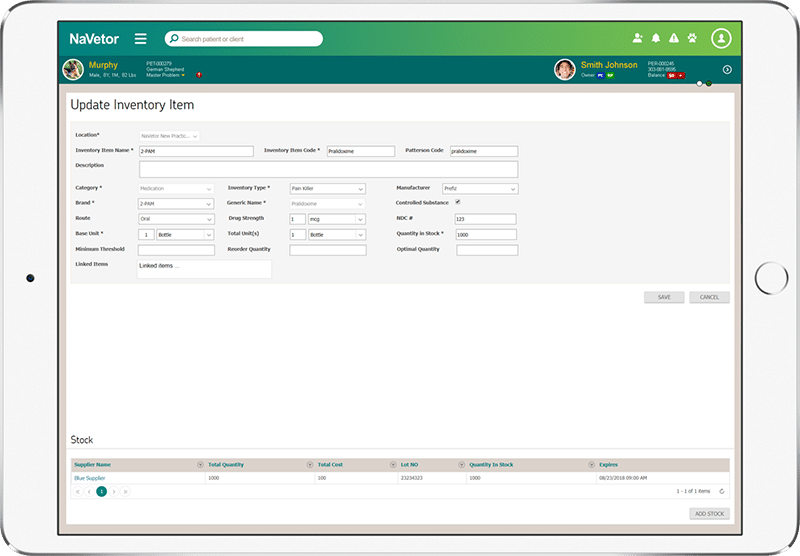 Comprehensive inventory management, built in. Manage your business with NaVetor’s comprehensive reporting feature. Any of your reports can be easily exported to .XLS, .PDF or .DOC files. The ability to accept credit and debit card payments from any workstation in your practice. One of the industry’s most secure platforms, combining encryption, tokenization, PCI and EMV standards. Real-time cloud-based reporting, whenever and wherever you need it. Mobile payments through Apple Pay™ and Google Pay™, for those customers who use them. Around-the-clock customer service and technical support. 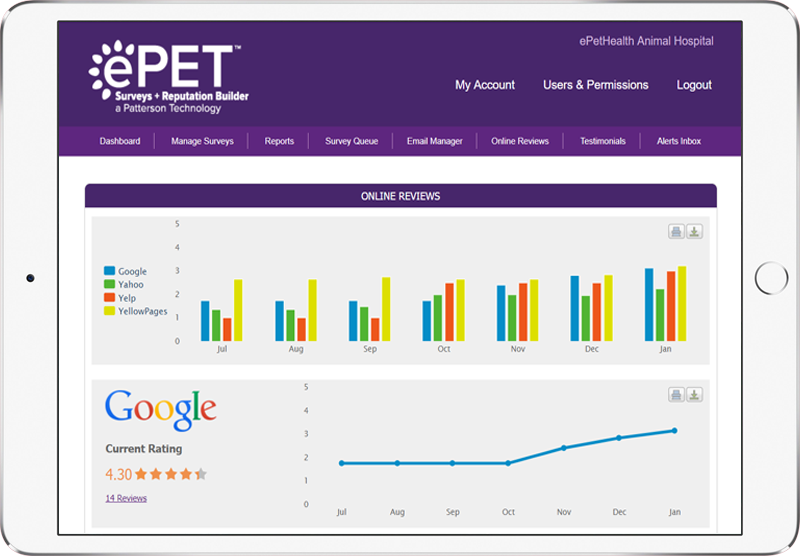 More and more pet owners are turning to online reviews to help them select the right veterinary practice. With Patterson’s Reputation Management solution, which integrates beautifully with NaVetor, you can send unlimited surveys tailored to each client based on visit type, post positive feedback on your website, and encourage clients to post positive reviews on public review sites such as Google and Yelp. Great client communication is a hallmark of great veterinary practices, and NaVetor makes it easy. 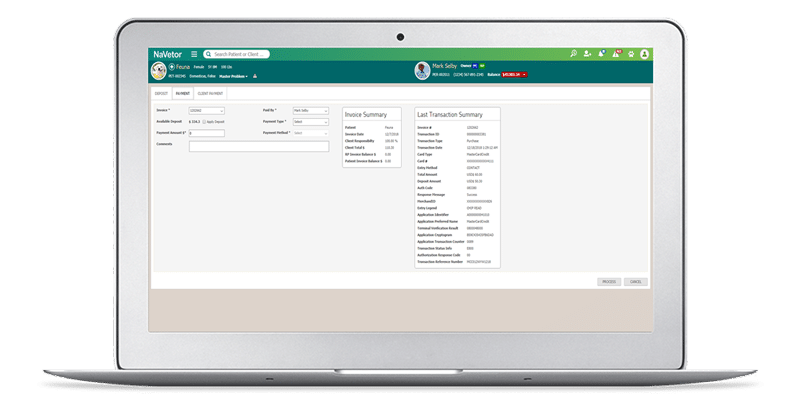 Send text and email notifications for appointment reminders, health service reminders, and birthdays right from NaVetor, through an integration with Patterson’s ePet Lite.